Dispatches from DC: What’s in a name? When I lived in DC way back in 2005, my nearest subway stop had, by any account, a ludicrous name. 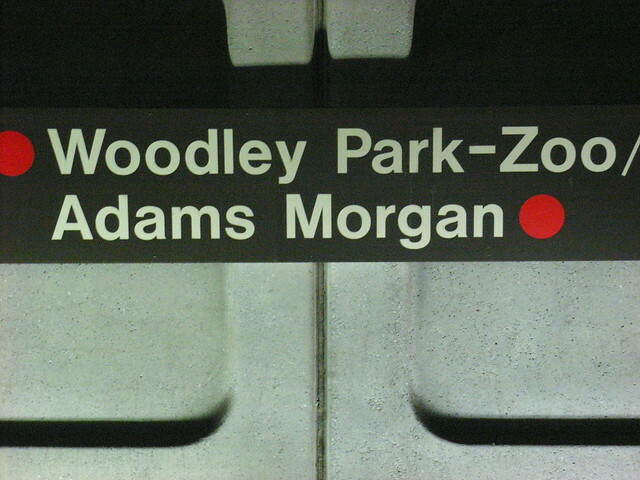 I lived a five- or six-minute walk away from the Woodley Park/Zoo-Adams Morgan station and always had a hard time coming to grips with its name. It was far longer than anything we have in New York, and it’s not particularly accurate. The Zoo is equidistant from the Cleveland Park station, and the walk from there is all downhill. Meanwhile, the red line services Adams Morgan in name only as that neighborhood is a good ten minutes away from the Metro stop. This ungainly naming convention wasn’t unique to my station. The U Street/African-Amer Civil War Memorial/Cardozo stop leads the system, and others such as Archives-Navy Memorial-Penn Quarter or Mt Vernon Sq 7th St-Convention Center try to cram in as much as they can in 19 characters. It certainly makes “23rd Street” on the West Side IRT seem runty in comparison, and if our worst station name is Sutphin Boulevard/Archer Ave./JFK Airport, we’re probably doing OK.
To plan for the proposed split in the Blue Line and the later addition of the Dulles rail extension, Metro is studying how people pick up visual clues about which train to take. Barbara Richardson, Metro’s assistant general manager for customer service, communication and marketing, announced last Thursday that the transit authority also is bringing back its original mapmaker, Lance Wyman, to revise the well-known map. How often do riders use the map, and what do they use it for? On the trains, there are big maps at the ends of the cars and smaller ones near the center doors. In a crowded car, some riders will stand on tiptoes and peer at it. Others need to get real close and study the text. Most commuters are taking the same trip every day, and they ignore it, unless a tourist asks for directions. There’s likely to be a lot of map-gazing during the upcoming Cherry Blossom Festival. Meanwhile, Greater Greater Washington has been hosting a contest this spring. They asked readers and cartographers to redesign the map, and a panel of judges selected the best. Readers have now been asked to vote on their favorites. The new maps had to show upcoming system expansions — an idea my readers have proposed for New York’s map — and must delineate between off-peak and peak service offerings, a key description now missing from our map. For now, those in DC aren’t concerned with the station names, but they have recognized in the past that it makes maps particularly tough to design. With lengthy station names, squeezing in that much typography leads to areas of the map that are tough to read and station names that do not adequately pinpoint their location. Should transit authorities label their maps based on the station location or the areas and neighborhoods within walking distance from that station? That seems to be the question with which DC must grapple, and the WMATA is leaning toward a new philosophy: The shorter, the better, says Barbara Richardson, the agency’s customer service officer. A map that’s easier to read may trump information overload. After all, it’s not too hard to tell someone to get off at Woodley Park to get to Adams Morgan. The station name needn’t be so inclusive and spare words may soon be getting the axe. Smithsonian? Like which one? If someone was looking for the Smithsonian Castle or the Natural History Museum, yeah OK, it’s there. But any of the other dozen or so. Scattered along the Mall. And beyond. The naming on the (probably to be named) Silver line looks much better in contrast. Back to New York for a moment, I never quite understood the naming of “47-50 Sts/Rockefeller Center”. Many north-south lines in Manhattan have entrances and exits on multiple streets, yet they are identified with just a single street number. Why is this any different? (The addition of “Rockefeller Center”, though, I have no issue with). The Independent railroad often names it’s stations after their multiple entrances and/or added neighborhood names, such as: Hoyt-Schermerhorn, Clinton-Washington, 47-50th, Broadway-Nassau (now shortened to Fulton), 182nd-183rd, 2nd Ave-Lower East Side. Neither the BMT nor the IRT tended to do that, and the IND was not really consistent either. “Lower East Side” was a fairly recent addition, when 2nd Avenue became the terminal for the V. It wasn’t an original IND name. In the late 90’s, many of the other terminals got neighborhood names appended. The IND was probably trying to differentiate itself from the IRT and BMT, hence the longer names. Also keep in mind that many IRT stations were only 3 or 5 car-lengths long for many years, so a good number of stations only hand one entrance at a particular cross street. It wasn’t until the years just after WWII that all the platforms were lengthened and new entrance/exit and transfer points were created between the three divisions. But W 4th St should really be called W 3rd-8th Sts/Wash Sq Park, under that assumption. Not really, since there is no other “4th St” or “West 4th St” station anywhere in the area, and Washington Square is a full avenue away. In midtown, “47-50 Sts” differentiates that stop from all the similar stations in the area (BMT 49th St, IRT and IND 50th St) and the Sixth Ave line stops directly underneath Rockefeller Center. W. 4th was so named in anticipation of the huge S 4th station that was supposed to open in Brooklyn but never did. But it’s sort of silly they they still are keeping that name, when they don’t say East 8th St. or West 14th St. It really should have become Fourth St. a long time ago. It should have become Third St. It doesn’t have an exit to Fourth. The hyphenations clearly aren’t for the purpose of distinguishing similarly named stations – there are two Clinton-Washingtons, and there are plenty of IND stations with identical unhyphenated names to other stations (even in some cases on other IND lines). I like the way Paris does it. Just long enough for every station to have a unique name. I’m not entirely sure that it’s the length of Metro names per se that is awkward, so much as the number of distinct units. For instance, at a hefty 32 characters, “81 St–Museum of Natural History” could hang with the worst of Metro any day. But it doesn’t feel all that bad because it has only two basic units, “81 St” and “Museum of Natural History”. Meanwhile, the worst Metro (and NYCS) names have three or more units each: your own “Woodley Park–Zoo/Adams Morgan”, “U St/African-Amer Civil War Memorial/Cardozo”, “Mt Vernon Sq/7th St–Convention Center”, “Archives–Navy Mem’l–Penn Quarter”, “West Falls Church–VT/UVA”, “New York Ave–Florida Ave–Gallaudet U”, “Sutphin Blvd–Archer Av–JFK Airport”, and “Jamaica Center–Parsons/Archer”. I feel like two distinct elements is the maximum for an easy name. Any more introduces awkwardness for both navigation and presentation. I’m sure the MTA was relieved to scratch “Fulton St/Broadway–Nassau” from The Map. Inspired by the London Underground, A friend and I renamed every station in the NYC transit system with neighborhood/landmark names. Ben, let me know if you want to see the map and/or spreadsheet. It took us a few months! I don’t know about Ben, but I WOULD LIKE to see it! It only makes sense to show lines that have not opened yet if the projected opening is within one year, and another map will not be issued on time. Otherwise what good would it do you today if the map said the Second Avenue subway will open in 2016, especially when in 2016, the projected date moves again to 2020. I also don’t believe that the lower half will ever be built. They know that and that’s why they picked 2 AV for the SBS in Manhattan. DC has often shown projected expansions. SF’s BART does the same. But these are systems with few lines and a very minimalist map. It’s done as a marketing ploy — look we’re building things! — than anything. NYer’s NOW we are building things. Construction is all over the system. I suspect another issue that SF and DC are expanding out into the exurbs, which looks better on a map than New York’s infill. That doesn’t necessarily mean that WE will live to see it. I am totally unfamliar with Washington geography, but what seems weird is that hyphenization. We don’t call it the “Central Park-Zoo”. In Chicago, they don’t say “Lincoln Park-Zoo”. It’s the National Zoo in the Woodley Park area. They just shortened it to “Zoo” kinda like the “Mets-Willets Point” stop on the Flushing Line. Adding the word “National” would make the name of that stop REALLY unwieldy. I had assumed that Woodley Park was a PARK that contained a zoo. I lived on Connecticut Avenue just north of the Van Ness-UDC station when the Red Line was being extended past Dupont Circle, and it just seemed as if WMATA’s station naming policy for certain stops were the result of a series of long negotiations/battles, while the final result produced a number of station names that are vague at best for the occasional subway rider or tourist. Archives on the Yellow/Green line still tops my list for least helpful station name, even if the name has now grown to Archives/Navy Memorial/Penn Quarter. Just put the name of the cross street(s) and at most one identifying landmark, unless the landmark is so well-known that a majority of people are familiar with its proper place on the map (“Pentagon” or “Union Station” in Washington, “Penn Station” or “Grand Central” in New York are examples were just using a building as the identifier is good enough for station signage). I think a big issue with the DC metro is that it was designed both as a commuter service and to get tourists around, and therefore, they went overboard with placing landmarks in station names. It also probably has to do with the distance between stations-there’s no need to tell riders that the Empire State Building is 3 crosstown blocks away when you can take a subway that’s two avenues closer. Imagine if the subway hadn’t been constructed until the 1970s. We might have stations like “Pennsylvania Station-34th Street-Seventh Avenue/Empire State Building-Fifth Avenue” or “Grand Central Terminal-42nd Street/Pan Am-Park Avenue”. Interesting to note is that the Vignelli subway map also included cross streets. So some names are really long on the maps, especially those of the IND that already have dual names (ie. Clinton Washington Av Lafayette St). Today I’ve noticed that on the Manhattan crosstown lines such as on 53rd St and 14th St, some cross streets are coming back, especially in the in-car digital signage, I presume to benefit the customer (7th Av – 53rd St), (8th Av – 14 St), etc. The Vignelli map didn’t show streets in the background, so it was necessary to indicate the street or avenue under (or over) which a route operated. On the current map, you can more or less see that the Seventh Avenue IRT (for instance) runs along Seventh Avenue, so only the actual station name is shown. In general, New York’s lines follow streets, and riders know, or are expected to know, where they are. Therefore, only the cross street is necesssary as a station name. In a place like D.C., where lines meander, you need more identification for each stop — New York Avenue and WHAT? The JFK Airport stop in the middle of Jamaica, Queens is a misnomer and needs correction. There are plenty of other stops closer to JFK to be named JFK Airport (albeit without the connection). JFK Airport is named as such precisely because of the connection to AirTrain. Travelers (and I suspect most NYers) don’t really care if there are other stations physically closer to the airport. Remember that subway maps are used to make riding subways easier. Changing the names of other stations to read “JFK Airport” would be extremely confusing since the other station don’t have major connections TO the airport. Then why don’t they call it Sutphin Blvd.-Archer Ave.-JFK Airtrain? Calling it “JFK Airport” is like calling the South Ferry station “Whitehall St.-Staten Island”. WE know what they mean, but how about tourists or people who recently moved here? It reminds me of when a movie review points out that many parts of the movie will probably not make sense to people who haven’t read the novel. Not a great analogy, since the station is called Whitehall St-South Ferry (check the MTA map). The idea is that you can catch a ferry to SI, as well as Governor’s, Ellis and Libery islands, so the name gives a very good idea to anyone riding the train that they can catch a ferry somewhere near Whitehall. The same MTA map reads Sutphin Blvd-Archer Ave-JFK Airport, so I’m not sure where you’re getting your info. If that analogy bothers you, OK, it’s like calling the 59th and Lex station “59th St-Lexington Ave.-Roosevelt Island” because you can walk just one block and hop the tram. Kudos for bringing attention to GGW, who does an amazing job, not just on Metro issues. While many New Yorkers might envy some aspects of DC’s Metro, we are at least safe from the proliferation of station names, mostly at the behest of local politicians who clearly don’t have anything better to do. A particularly annoying aspect of this is that, since some of the lines in DC do not go strictly speaking eastbound or downtown, the direction is usually described by the name of the final station (“Orange Line to New Carrollton”, that sort of thing). I lived in DC in the mid-90’s without a car, so I could navigate Metro while only half-awake, but now when I visit, I find that most of the stations have changed their names just enough that I have to think twice about which train I want to get on. Be thankful the MTA and WMATA don’t use Arabic names, where the “last name” is a chain of “son of [father’s first name]”, no concept of family names. The debate also brings to question hyphenated western names, marriage or some ridiculous “honoring” of heritage, especially when it includes all grandparent’s maiden names. Stations names should be no more than 3 words, and still intelligible if shortened to 1 word. I prefer made up names (Queensboro bridge vs Edward Koch), rather than honoring of dead grey haired privileged men. For the first 100 years of the USA, actual born humans were banned from coins, for a reason. The USA fought the revolutionary war for the privilege of not having honor, praise, worship, and gratify, a mortal man/woman turned into a deity, under the force of law, for example the Monarchy of Britain. The USSR had Lenin and Stalin as their national Gods, the USA in the last 100 years choose Franklin and Washington to be their Gods. I’m waiting for a large bronze statue of George W. Bush to appear infront of the Pentagon any day now.